Vitamins & MineralsUniversal Nutrition ANIMAL Pak - 44 sasz. Ever wonder which product vitamins and minerals is the best and why? I hasten to answer. This is Animal Pak because there is no other such a complex product on the market, which has been recognized by bodybuilders worldwide. Animal Pak ™ - 17 years selling training pak in the world. 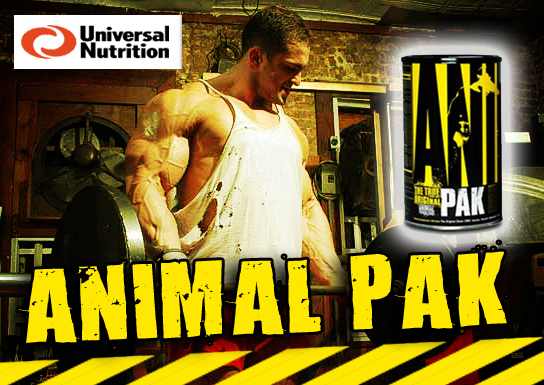 Since 1984, Animal Pak ™ has become the most popular means of bodybuilding supplements in history. Why? It's easy. Animal Pak works. For the first time. For the last time. Whenever!!! In all her ingenuity, she has designed the human body as a machine the ultimate performance. It's a fact, since the beginning of mankind, our bodies have changed very little. As for the "feeding" our muscles, we still need the nutrients we get from our diets. But when it comes time to grow our muscles in a freakish way, we need the right combination and the respectively higher doses of amino acids, carbohydrates, vitamins and minerals. Only Animal Pak ™ has what you need. You're the kind of primal beast who trains with Animal intensity. You need plenty of these substances, as well as a few extras, which also are included in Animal Pak ™. In each pack you get a dizzying array of over 55 key ingredients which are delivered in the right quantities and at the right time. Each of the 11 tablets included in the package was created specifically to provide you with the necessary elements. By taking the Animal Pak, you prevent the formation of nutritional gaps. Why should you care? The greater your training intensity, the faster they grow, these shortcomings and that are larger. When that happens, eventually you hit a plateau. You stop growing. Maybe you've already hit this wall. To make matters worse, if you take other supplements, these same gaps begin to render those expensive supplements useless. Many of today's supplements rely on enzymes and other substances in your body to "activate" them. Deficiencies in your body mean these key activators may not function at all, so you may find that you are wasting your hard earned money on supplements that will not or can not act. Imagine that the Animal Pak ™, a cast iron skillet of your supplement program, the first line of defense of your body. If you train weightlifting, the Animal Pak ™ is a must. Remember, while most supplements have come and gone, precious few have stood the test of time. When you are ready to choose the best means to select the best name in serious bodybuilding Animal Pak ™.